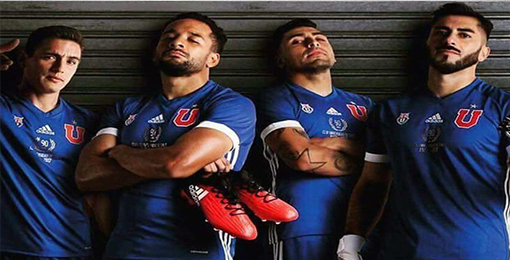 If you want to buy cheap universidad de chile shirt for 2018-19 season, buy it here in cheap-football.com , Check our exclusive range of universidad de chile Football Shirts / Soccer Jerseys and Kits for adults and children at amazing prices. Get the cheap universidad de chile jersey shirts, soccer kits with wholesale price, Free Shipping Worldwide! Universidad de Chile is a soccer club of Chile of the city of Santiago in the Metropolitan Region. The club was founded on May 24, 1927. Universidad de Chile is one of the most successful and popular football clubs in Chile, having won the league title 18 times.In the last 10 years, the team has been crowned champion six times.Universidad de Chile was the champion of the Copa Sudamericana 2011 (the first international title of its history). In this tournament, the club had an excellent performance: wasn't defeated, won all their matches in Chile and had the top scorer of the tournament's history .